Bouncy Basketball is a fun twist on the classic sport of Basketball. In the game of Basketball players must dribble the ball and are not allowed to run with the ball. 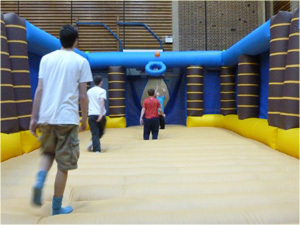 With our Bouncy Basketball players must substitute dribbling the ball with bouncing on the inflatable court and shooting at the basketball hoop. The game can be played by up to eight players in two teams of four. 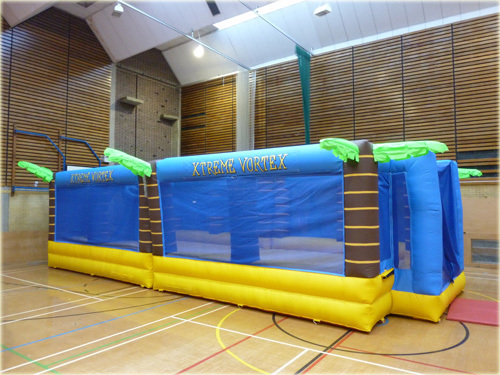 We always provide a member of staff to run and referee our Bouncy Basketball to ensure the activity is run smoothly and safely for your event. Our staff are fully trained, have enhanced CRB disclosures and a first aid trained operator will be always be present at your event.